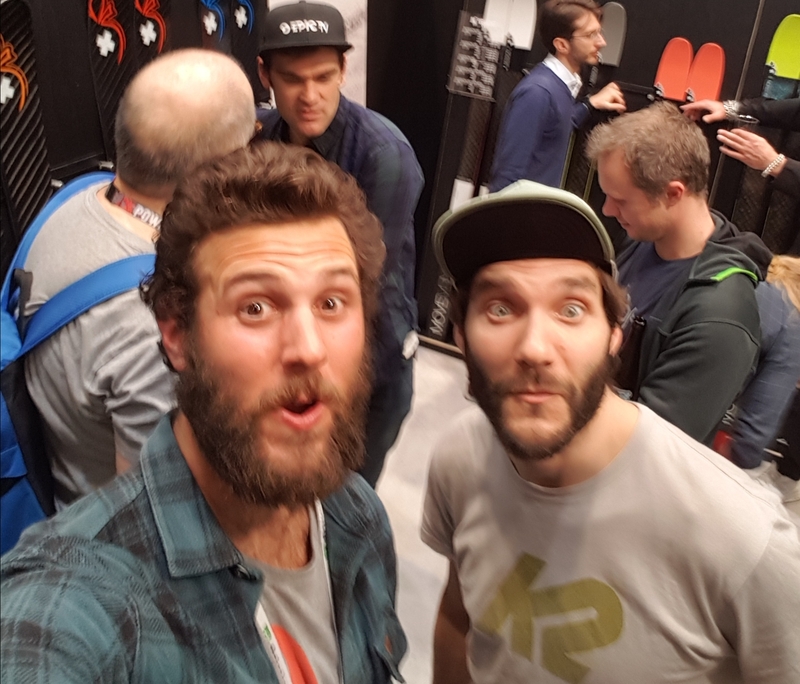 ISPO 2018 the good, the bad and the ugly. And once again, Onthebelay attended the ISPO ready to rock! 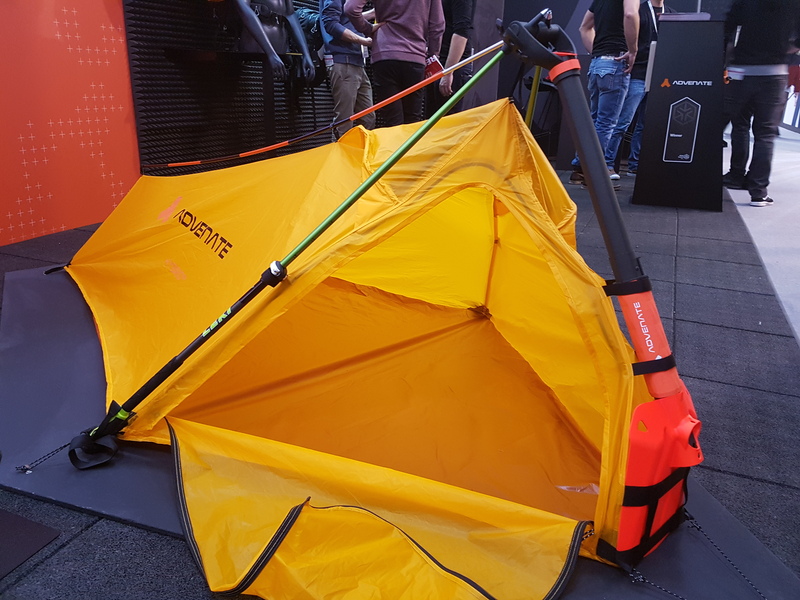 ISPO is the biggest european outdoor industry gathering and a great chance to see where the industry is heading, check the new products and get to meet small manufacturers that are doing interesting things but that we don’t hear that often about them. Well, and beer, Munich is always a great excuse to get one too many beers. I find funny how quite often when several medias report this kind of trade shows they tend to talk about “the best product”, “absolutely game changer” and so on. 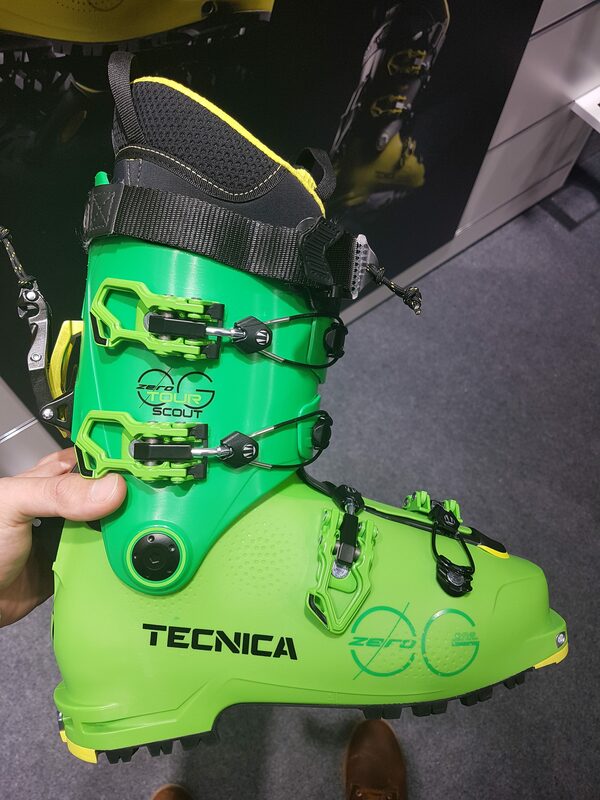 I think it’s a big statement going that far when something has just been launched and before it has really been tested by the public, more often when sometimes I’ve even seen reported as revolutionary a new print on a ski that had not changed its structure in a few years. Well, from my report I’m going to aim the products that have catched my attention and that I believe they could have some potential. Not only innovation for the shake of innovation, but products that I believe can give me an advantage in the kind of activities that I do on the mountain. Of course everything would need to be tested before taking one final statement, and as you know me I will be quite biased on ski mountaineering at that particular spot where it meets freeride. 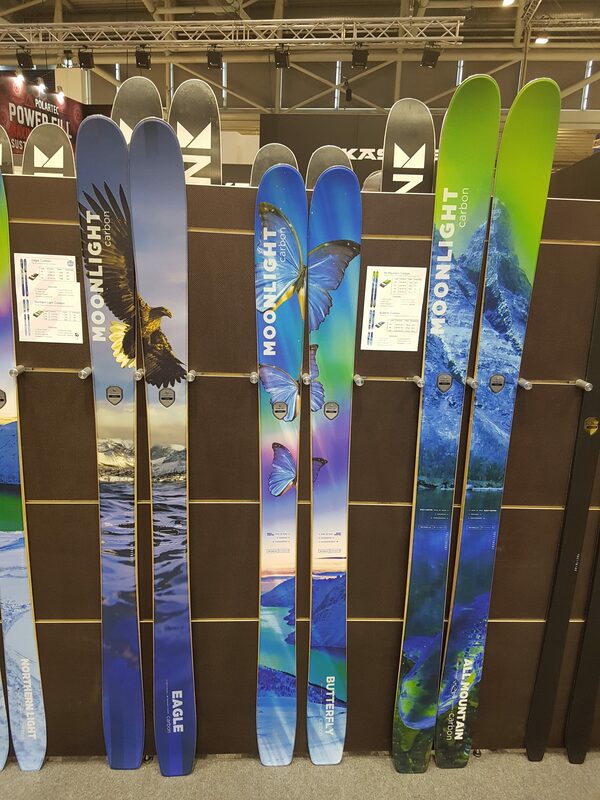 All mountain Carbon 179cm 132-106-121 and 1390g. For a ski under 1400g, the volume is enormous. The ski profile has a great effective edge and achieved stiffness for crushing lines in the big mountains. With the climbing weight of a mid fat, you’re pretty much almost getting a fat. 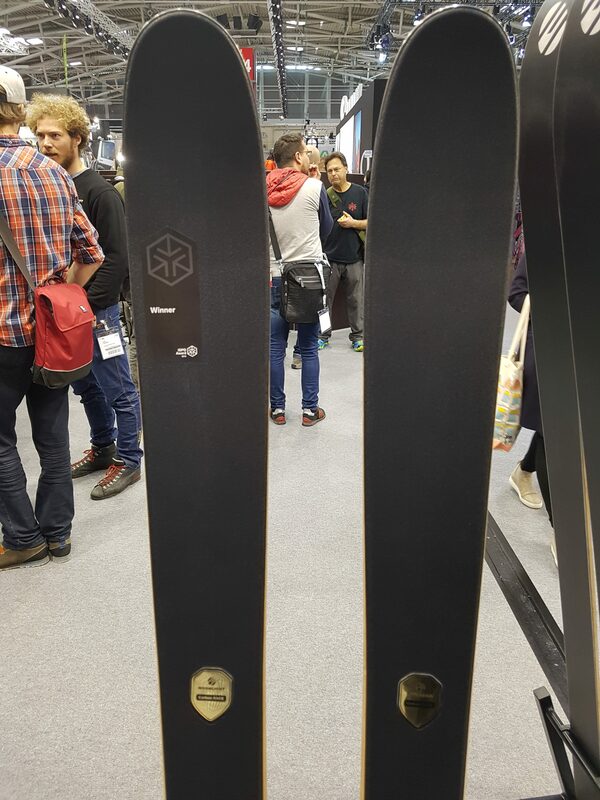 Eagle Carbon Race ISPO GOLD Award 177cm 130-95-120 and 1040g. A ski with such a large volume, a proper downhill ski profile and weighing 1kg? The stiffness is achieved. Don’t get me wrong, I wouldn’t ski it like an animal dropping cliffs or pulling tricks, but it looks like it could be a great glider. 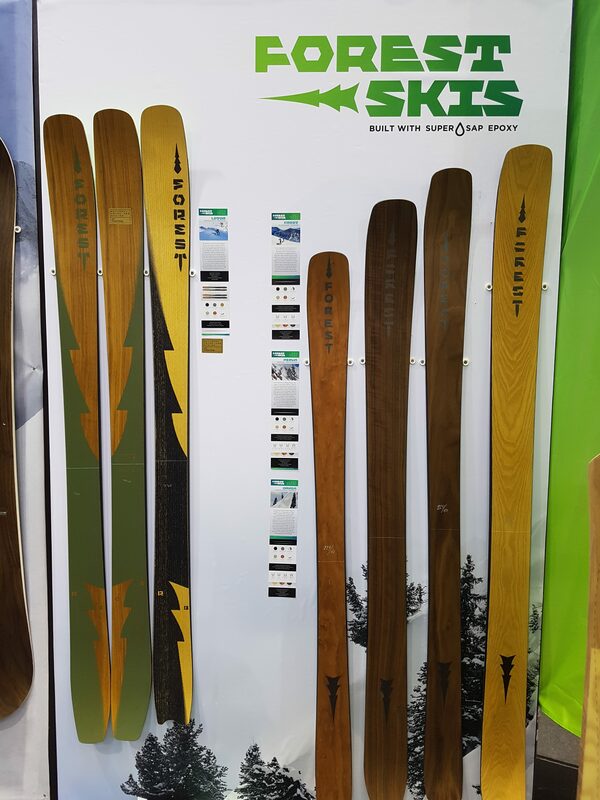 Due to the beautiful minimalist wooden print, those skis may trick you and seem to have a simple construction, but dam, there is a big engineering behind them. I was surprised by their building strategies to reinforce the structure while absorbing and distributing the shocks that I sometimes miss on big manufacturers. They have some “standard” models, but their big strength is a full customized building process, where you get in touch with them and after going through an extensive consulting the build the right ski for the right kind of activity that you aim but always with the mantra of a ski for a proper riding feeling, strong to the core and with a focus on freeride. Back to the classics: K2 and Black Diamond have retouched they mountain models Wayback and Helio. I’ve been less excited about this manufacturers, especially cause last year my wayback barely lasted 3 months. I don’t know if it’s fair to put Black Diamond in the same bag, it’s been two years since I don’t ski their Helio range, but I’m doing it anyway. Light and tough. How well does this apply to the backcountry freeski planks? Finally Marker released a binding for ski alpinism and I’m close to more excited than when they released the Kingpin. The weight per strength is definitely impressive. I’m a big fan of the brake locking system, although it must be tested to see how it responds to icing, and as well about the fast touring/ski mode without having to turn around the binding. Their were not present in the trade show, so I couldn’t really get my hands on them, but on their presenting videos and from the instagram of their athletes we are really looking forward to know more about them. They have updated some mini improvements learned through those two years. 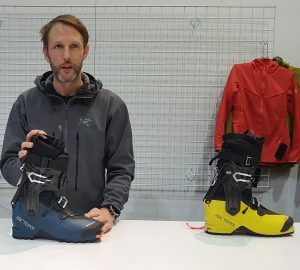 A more comfortable fit around the toes, a higher cuff for improved stiffness on the downhill, a few improvements on the strap, but the biggest change is dividing the range in two main branches: One more focused for alpinism (yellow) and another more downhill oriented, (blue). 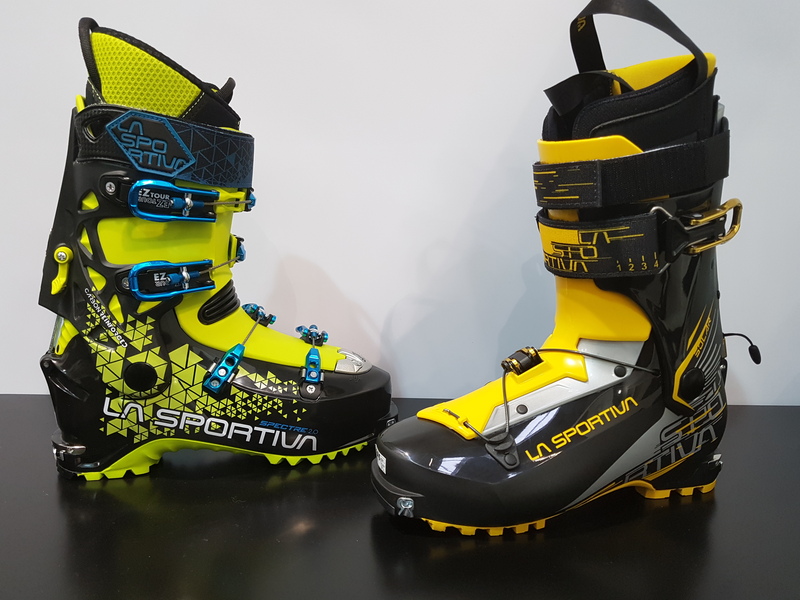 There is not that much difference between both, the yellow has a more refined sole for alpinism on rock and mix terrain, while the blue has a more simple rubber print and profile. The blue is slightly stiffer, especially due to a more robust strap and some more beef on the cuff. Having both on my fit, I could not feel a great difference, but I had a great feeling for the blue one, that weighs 1300g while the yellow 1240g. Regarding the flex, it’s not really an official scale and it’s more about marketing, but I felt that with the blue one I should be able to ride properly semi fat skis on a great variety of conditions. Well, this always depends on the skills of the rider, the product designer showed me some pictures of members of the team riding them with 122mm underfoot skis in Japan and skiing better than all of us together. The new f1 has improved in terms of weight and stiffness, especially due to the grilamid construction. Due to the Alien RS, the F1 has needed to outstand becoming a bit more skier, and that’s great news for us. It is a bit higher and with the double power strap we feel solid on the cuff. The concept is pretty much the same, but slightly improved. are one of those unconditionals of the four hook boots, then it’s worth checking this one up. Personally I’m not always a big fan of four hooks. They are as sweet as it can be for freeride but for moving on the mountain and skining uphill, they are clumsier. The previous model had problems with icing on the walk/ski lever. We should check if this has been improved, but at first sight the constructions seems pretty similar. The now classic Spectre made quite a big shock four years ago when it was introduced. Now it has a new re-look and some general updates. A bit better weight/stiffness ratio and mechanical ease on the walk mode. Nothing over the top, but well appreciated. 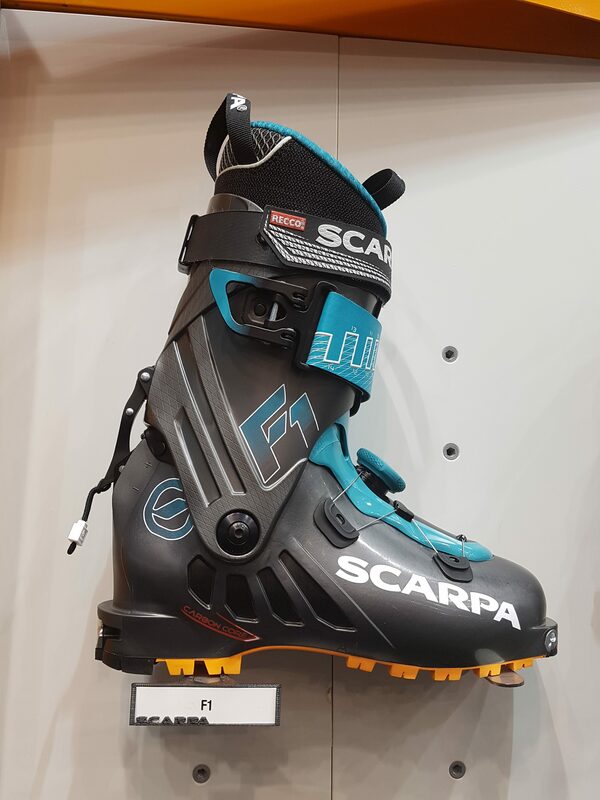 The SOLAR, as you can see, go on the direction of the F1 and the Procline; ski alpinism boot but with a focus that slowly shifts towards improving the downhill. We’ve been bombarded lately on social media about this boot and we are excited about it. 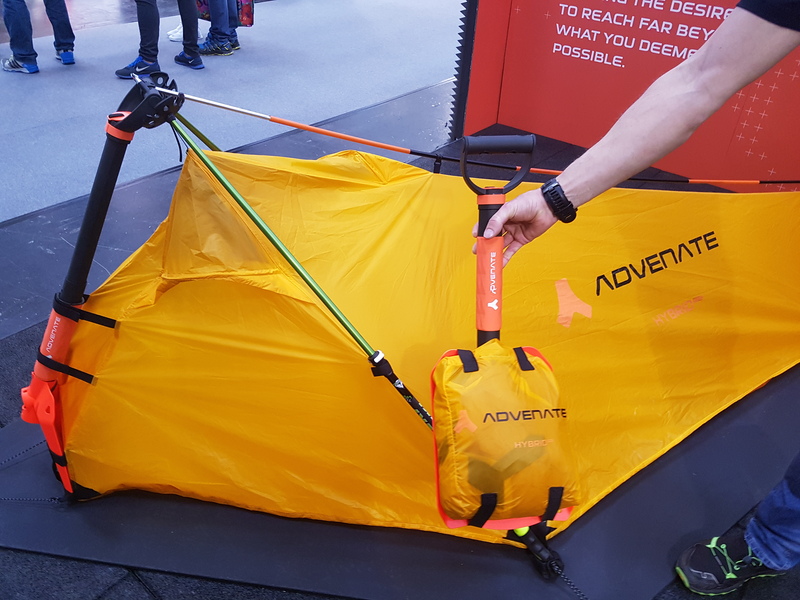 However they were not at ISPO, well they had a mini stand but without products and more focused on the posing, so this time we could not get our hands on it. The only thing that doesn’t really convince me is that they removed the toe nail, so they are not compatible with automatic crampons. Apparently is for getting better swing touting uphill, but it’s still annoying. This is the most powerful headlamp I’ve seen and it is very clever the mounting over the gopro system. These guys live and ski in the arctic where they don’t see the sun for two months, so you can tell they put all their heart in making good headlamps. Without even going into the 10 000 and focusing on the 5000, you almost need sunglasses at full power. It has four positions. For going uphill, you normally use the first position. It’s 7.5% of its power and the battery can last 12h. If you need to spot a crux or further on the route, you can always go full blast. For the downhill you use the 4th position at 100%. The battery can last 1,5h on that position. The battery can go strapped on the back part of the helmet or the backpack. 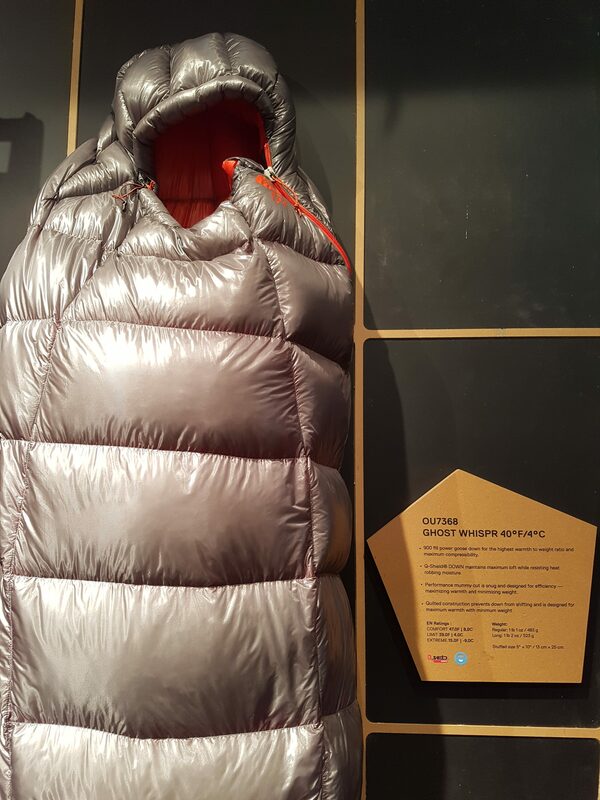 MH has launched a sleeping bag with their best seller ghost whisperer technology. What does that mean? Hyper compressibility and ridiculous weight for a high thermal insulation. Comfort temperature of 4º, extreme of -9º and a weight of 483g. Yes, you heard right, less that half the weight of your water bottle and not that much more volume! Well, BD seems to have started to make beacons, this may be not all that surprising considering that PIEPS already belongs to the BD group. The strengths of this device seems to be a great range of action of 60m circular radius, ability to scan and mark positions while keep searching, (in case of several burials), and that it can be connected with your smartphone via bluetooth to program it’s settings and optimize the usage. Well as beacons is a delicate piece of gear, I will definitely wait to further tests and discussions of the community before deciding on this one. Finally another brand has achieved to face petzl in this segment. 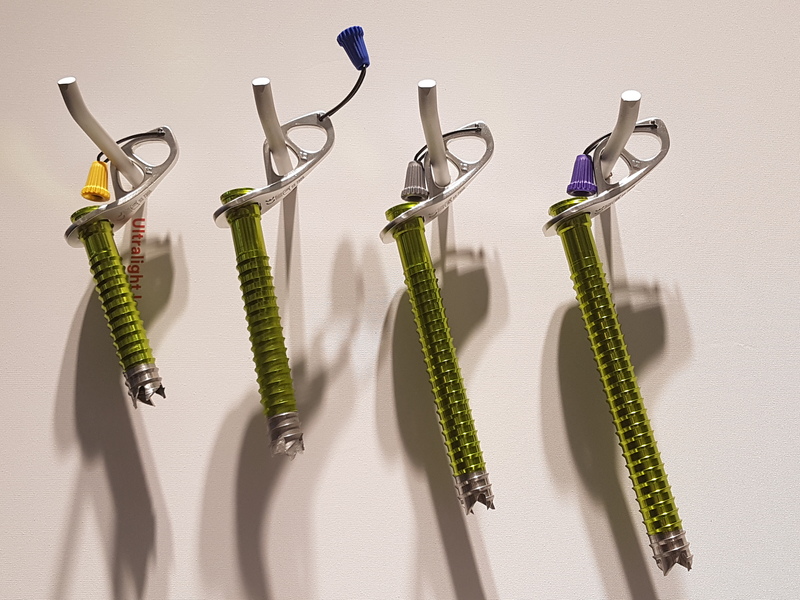 The ultralight weights 45% less that their express screw and just as the petzl model, the body is made of aluminium while the picks are made out of steel. This category of screws are weaker than the full steel ones, but for activities such as ski mountaineering or light alpinism were you always carry two or three screws just in case, then you have a significant weight advantage. 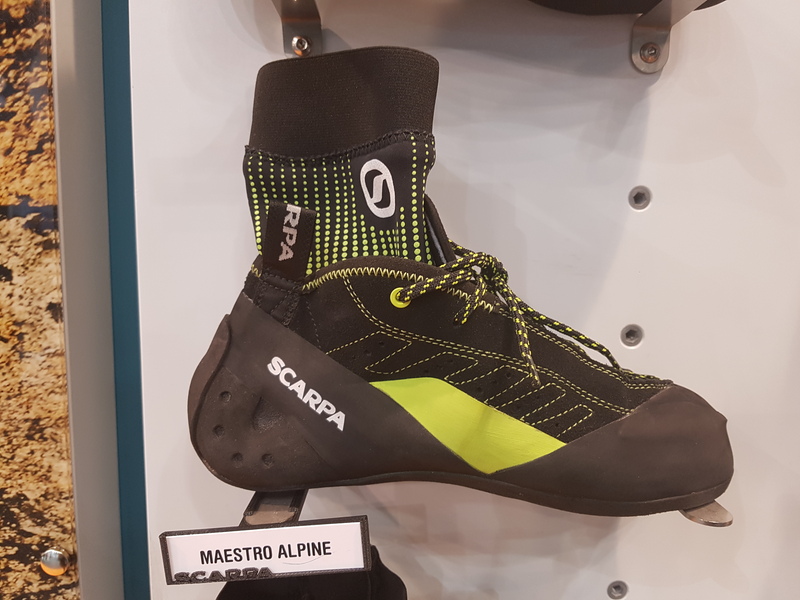 A climbing shoe especially designed for winter alpine rock climbs with great insulation both due to the lining and the thermal gaiter. Now we can keep dreaming of been a bit closer to climb in baffin, the trango tower or the dru. There is as well a more simple model on mid without the linning and the gaiter. Seems like the TC pro may have a rival on the market now. This is quite curious. A shovel that integrates a whole bivouac system profiting of the probe, poles and tent spikes hidden in the structure of the shovel. Is this really a need instead of just carrying a bivouac bag? Well, I don’t know, depending on the situation and the person I guess. 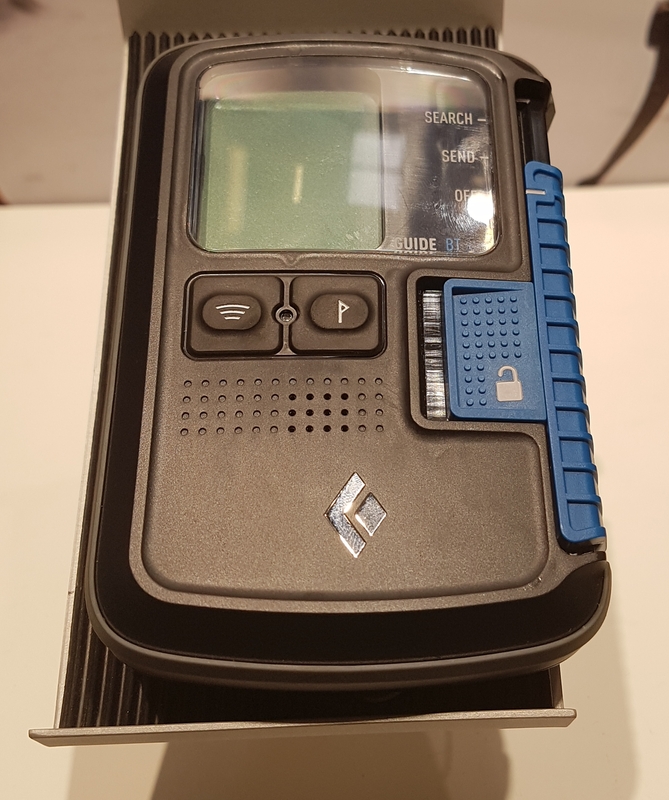 There are things to refine in the design but I feel pride for small manufacturers that step up and decide to give a further twist to our gear and look for new functionalities and optimizations. Finally, what made me the most excited has been to meet again great friends from the industry and from my days in Chamonix. Definitely this little family is full of great professionals, better persons and very fun people to have one too many beers with! This entry was posted in Gear Guides and tagged Alpinism, Climbing, MountainSki. Bookmark the permalink. ← Testing the smartest active down jacket of the season. Helly Hansen Odin Veor.